A couple years ago, I was able to visit the Providence, RI area. One stop amongst many was a beautiful clubhouse that overlooks the Narragansett Bay, called the Squantum Association, a semi-private club with history back to 1872. One of many interesting things about the place was a drawing by Thomas Nast, who, like many other notable people of whom I have heard, sounded familiar but without the slightest recollection. The drawing was a self-portrait sent in gratitude for a visit to the club. 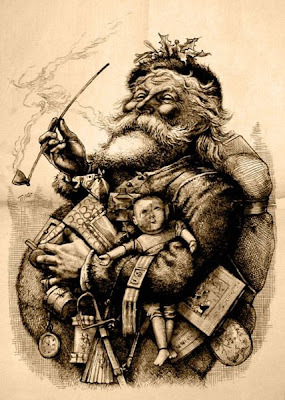 Thomas Nast is probably most noted these days as being the creator of the modern image of Santa Claus. 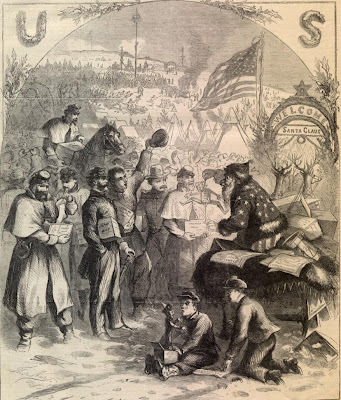 This originated in 1863 with the following picture, with Santa handing out socks and other items to Northern soldiers. His Christmas scenes were not his main focus, however. 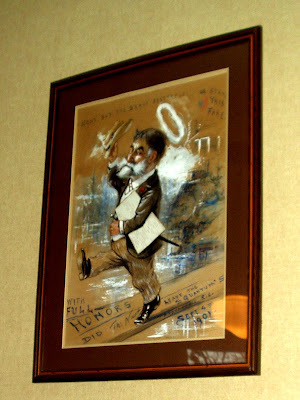 During his career, he gathered signifcant influence with his political cartoons, published regularly in "Harper's Weekly." Per the Democratic Party's official website, the donkey was first used in the context of their Party in describing Andrew Jackson's stubborness during his first political campaign for President, but it was not used until many years later in a political cartoon about him. However, they credit Thomas Nast with associating the Party by this image beginning 33 years later. Ironically, it was not meant as a favorable image, but rather ridiculing an anti-war faction within their Party. With repetition in his political cartoons, the icon became the unofficial symbol of the Democractic Party by 1880. And that, ultimately, is why I took the time to research this. Haven't you ever wondered why a Political party (foreign or domestic) would want a jackass for a mascot? Or, even if played more gently, a donkey? 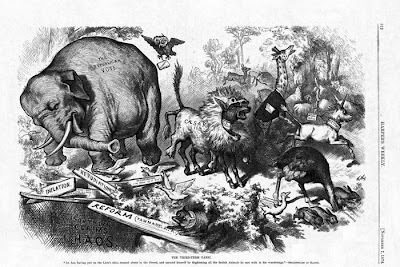 Quoting from the Dem's site, "Although the elephant had been connected with the Republican party in cartoons that appeared in 1860 and 1872, it was Nast's cartoon in 1874 published by Harper's Weekly that made the pachyderm stick as the Republican's symbol. A cartoon titled "The Third Term Panic," showed animals representing various issues running away from a donkey wearing a lion's skin tagged "Caesarism." The elephant labeled "The Republican Vote," was about to run into a pit containing inflation, chaos, repudiation, etc." The idea was that Democrats were trying to scare Republican voters away from a third Ulysses S. Grant term. Interestingly, in these days of product branding and trademarks, the Democratic Party has still not officially adopted the donkey as their mascot (though they use it widely), while the Republicans have officially adopted the elephant. It begs an interesting question. What icons they would choose if they were to start from scratch and begin the process again. Doves and hawks? A tree and an axe? A bouquet of flowers and a pistol? A wishing well and an oil platform? Peanut butter and jelly? For the last, certainly not, because we know despite all the platitudes of bipartisanship, they clearly don't mix well together. The next question... if they actually came up with an icon that had cultural appeal, would anyone buy it? Given that so many actually (or apparently) believe what politicians say, I suppose so. But no one seems to be out buying donkey and elephant gear (at least who is not attending a political convention).